Hypothyroidism is a disease caused by insufficient thyroid hormone production. The thyroid gland is located in the neck, on either side of the trachea. It produces two hormones: thyroxine (T4) and triiodothyronine (T3). Thyroid hormones affect the rate of metabolism in most of the tissues in the body. Thyroid hormone deficiency leads to illness. Any breed may be affected, although Golden Retrievers and Doberman Pinschers are at increased risk. Hypothyroidism usually affects dogs over three years old. Diagnosis is made by blood tests, often of a Total T4 along with blood chemistry tests and a complete blood count to rule out other illnesses. Sometimes a Free T4 test may be added. Treatment is by supplementation with synthetic thyroid hormone. 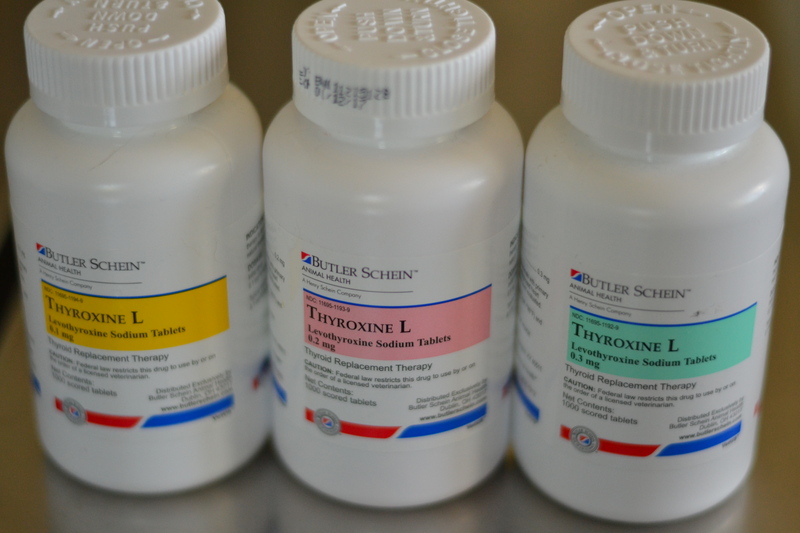 Levothyroxine (L-thyroxine), also known by the brand names Soloxine and Synthroid, is effective, safe, and readily available. Improvement is usually seen within 1-2 weeks, though it can take up to 8 weeks for dermatological problems to improve. Often the dose needs to be adjusted after the first month or two, and it is important to follow up with rechecks. After that most dogs do well with yearly rechecks. Greyhounds are a breed known to have low physiologic Total T4 levels. The significance of this is unclear, and most do not need to be treated.